Originally published in Great Britain in 1972 and distilled from the collective wisdom of the great interpreters of dreams – Freud, Jung, Adler, Stekel and Gutheil, among others – this comprehensive key to the baffling language of dream symbolism is a thought-provoking and invaluable guide to the uncharted country of the mind. Tom Chetwynd has isolated for the first time the rich meanings of over 500 archetypal symbols from the indiscriminate mass of dream material, and rated the likelihoods of the various possible interpretation in each case. Here are the essential clues to understanding the ingeniously disguised, life-enriching, often urgent messages to be found in dreams. 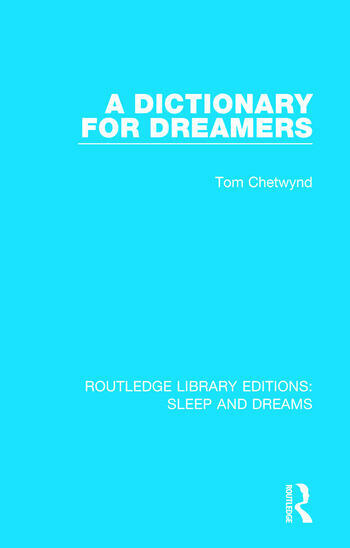 This dictionary is a selection of the most significant discoveries of the seventy years prior to publication about the mysterious nature, the hidden meanings, and the purpose of dreams, arranged in a manner intended to help the individual to understand his own dreams.